“When he lifts his face, ev’ry ear in the place is on him.” These lyrics from Neil Diamond’s hit, “Brother Love’s Traveling Salvation Show” fittingly describe the scene when Bob Lee hits the stage. Bob, vice president of sales for Berk Wiper International LLC of Boyertown, Pennsylvania, also fronts Real Diamond, a Neil Diamond tribute band that performs all over the country. 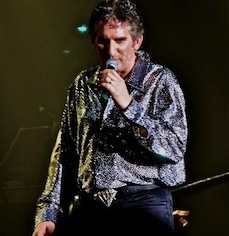 Bob, also known as Curtis DiDomizio, has sung and played guitar in a variety of rock-and-roll bands for over 30 years. He has also been a karaoke host and performer, which is where his raspy growl and strong baritone voice began to remind people of Neil Diamond. “My late uncle, George DiDomizio, had a lifelong friendship with Elvis. When I was doing karaoke, I sang Elvis songs because of my uncle,” says Bob. Bob started Real Diamond in 2008 with 27 songs and a 10-piece band. “Sometimes we need a third singer for the Diamondettes, our female singers, so Amy Berk, who is married to Berk Paper’s president and owner Jeff Berk, steps in,” he says. Real Diamond plays to the 40- to 80-year-old demographic, often to sold-out houses. The band plays in casinos, performing arts centers, outdoor venues, and private events. Bob does some of the booking himself, but the band also uses 15 agents throughout the country. Bob does more than just sing Neil Diamond’s tunes — he also dresses the part of the performer. Though he usually has his stage clothes made by a tailor, sometimes he has to create his own costumes. The band recorded a live album in early July in Sea Isle City, New Jersey. “To pay tribute to all the New Jersey cities that love us, we called the album, ‘Hot Jersey Nights’ (a play off of Diamond’s live album, ‘Hot August Night’). About 9,000 people were there, singing and dancing. There were fireworks while we played ‘Coming To America,’ our encore number. It was awesome,” he says. Apparently, filmmakers think so, too. The band is going to be featured in a documentary called “Play Me,” a film depicting the on-and off-stage stories of Neil Diamond tribute artists. But, even with the attention and accolades, Bob stays humble.